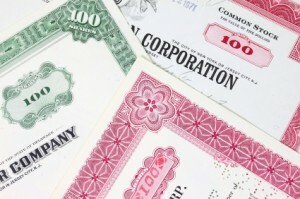 Save those annual reports and dusty old stock certificates, they may be worth money! I come from a family with a few members that are avid collectors. My aunt and god-mother collected everything from spoons to stamps and dolls. Dad too, liked collectibles – from old tools to silver dimes. It is a joke among the rest of us when we say, “Save that, it will be worth money someday”. Because of the acquirers in our family, I have a collection of odd, old stuff that may or may not hold monetary value but sometimes has emotional value to family members. Things like part of an old glass doorknob, an iron burner cover from a wood burning stove, hubcaps from several makes of cars, old license plates, and yes, old financial paper all reside in my domain. We have stacks of canceled stock certificates, old checks, quarterly and annual reports and more stuffed into our metal file cabinet drawers, embedded in those old tin table top file chests and interred in the family ‘heirloom’ chest. Casting about for a unique and interesting gift to give my spouse on our 41st wedding anniversary (it gets harder each year! ), I thought of the little metal table top file cabinet his Mom passed along to us several years ago. In it I found the heart rending evidence from the 1930’s of my spouse’s then recently widowed Grandma trying to settle her spouse’s estate in the midst of the depression in the thirties. Letter after letter surfaced, conveying the devastating news that the investments her husband had made were now worthless. Bank stocks were in receivership, companies were going through bankruptcy and the estate was very small. One company apparently went out of business and closed up shop – evidenced by the return to sender of her letters to them. That company was one in which my spouse’s Grandparents owned 100 shares. The stock certificate was in the file, in great shape and had a really interesting picture on it. There were several letters and quarterly reports included as well. What a great gift this would make for me to give my hubby for our anniversary! He loves history, it is history from his own family and we are investors! I vowed to frame it all for display. I researched it, to see if the stock potentially still had monetary value but couldn’t find any information by searching online. It is for a cooperage company that was in Kentucky. A cooperage company makes wooden staved barrels, casks, tubs, buckets and more. Although there isn’t much demand for wooden barrels held together with staves these days, some are still made. I’ve also sent an image of the certificate to our full service brokerage firm to see if they can find anything more out about the company. Framed, with a pocket on the back to hold the correspondence and quarterly reports, it makes a unique and hopefully appreciated gift. Since I framed it myself and got the frame half price at Hobby Lobby, it only cost about $30 for the gift. If you have old financial paper, read on, you may want to become a scripophilist (a collector of old stocks, bonds and other financial paper). Perhaps you may hit the jackpot, with something such as a pre 1960 Chinese bond. Wealthy orientals are reclaiming their financial heritage by purchasing these. What annual reports might be worth money? If the report is for a well known company and the report itself has outstanding graphics or is for some kind of exceptional period in the company’s history, it might be worth money. A recent search on eBay, showed that folks are trading Berkshire-Hathaway annual reports, Disney reports with great graphics, along with many other company annual reports. Reports from the 1950’s era also seem popular with this GM report being offered for a buy it now price of $31.99. I suspect that automobile aficionados as well as folks who follow a particular company would be customers of this. The highest priced annual report I saw was a collection of Bear-Sterns reports from 1997 – 2003 and 2005. Listed for $1995.95 ! A 1966 Disney Company annual report sold for $338. A Marvel 1992 signed company report with Spider Man on the front sold for $26. Older (last century and prior) reports and reports from defunct companies (such as Montgomery Ward) also commanded sales. What stock certificates are collectible? “Pierre Bonneau, CEO of Tucson, Ariz.-based Stock Search International, the place that tracked down Lynne Callison’s certificate, says anything issued in the 1880s — especially railroad, manufacturing and oil companies — is probably valuable. What else might be valuable as a collectible? Just about any older financial document might be of interest to a collector, especially if it spans collector categories or has the signature of a famous person. Inventories, letters, invoices and yes, even checks can be valuable. Have you stumbled upon any old stock certificates? What did you do with them? A framed stock certificate with family ties from the Great Depression sounds like a great gift for your husband. We don’t have any collectibles like that, but my mom has stuff from WWII. I have no idea how valuable old ration books are, but I think she has a few squirreled away somewhere. WWII stuff is pretty hot right now. My spouse collects, so you might check it out and let her know so she can preserve them correctly or get the funds from them if she needs it.